In the world of news and current affairs, past and present, there has always been one man who presides over national events – jubilees, funerals, weddings, general elections and so on. That man is David Dimbleby. Born in 1938, Dimbleby was born into a family of journalists and broadcasters. His father, Richard, was one of the most recognisable figures in the broadcasting industry. Today, David, and brother, Jonathan, remain at the centre of national events. David joined the BBC as a news reporter in Bristol during the 1960’s. Some of the programmes and films that he was a part of became the heart of intense debate between the BBC and the political parties, in particular the Labour Party, during a documentary which is claimed to have ridiculed the opposition. He later became the presenter of Panorama – one of the BBC’s longest running programmes, using the best investigative journalism to uncover truth and investigations into many a topic, including governments, economies, war crisis’ and famine on a global scale. David’s father had previously presented the programme. Since 1979, David Dimbleby has been the face of one the most exciting nights in broadcasting – Election Night. 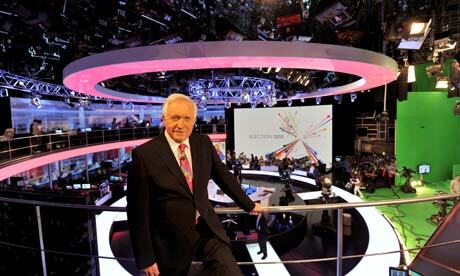 The long running, overnight coverage, often broadcasting well into the following day has been presented by Dimbleby successfully over the past seven General Elections. His knowledge, passion and interest certainly comes across in his stark interviews with political leaders and journalists bringing the results. Dimbleby has lived through many previous elections and governments and uses his own experiences of leaders and parties gone by to provide a very personal yet professional approach in the huge 12+ hour broadcast. David Dimbleby stands over the BBC’s Election Night studio. As well as the famous Election Night coverage, David Dimbleby is also known as a national broadcaster, presenting and commentating on national events. In the past these have included The Trooping the Colour, State Opening of Parliament, Funerals of Princess Diana and The Queen Mother and anchoring the Golden Jubilee celebrations in 2002. He will return in providing coverage of the funeral of Baroness Thatcher on Wednesday 17th April 2013. His knowledge of royalty, governments and the changes society has undergone makes him the ideal choice for covering the events which bring viewers to a collective halt and broadcasting to the millions of viewers in the UK and accross the globe. Today, he is best known for his role as the anchor, presenter and chairman of the BBC’s flagship debate programme, Question Time. He has been in this role since 1994 and 19 years on, his command is still apparent on the panel and feared by many politicians. Dimbleby’s nature as a political broadcaster and as a man of outstanding knowledge allows him to question the politicians, often using evidence to contradict what a member of the panel has said. David describes himself as the “chairman” and often reminds the panel that he is in charge. He presents himself as supportive to the audience who ask the question through his further interrogation. One thing which is admirable in this role is the balance that Dimbleby provides. His attitude of respecting the speaker in turn for respect of him is what makes the show flow so well. “Dimblebot”, as he is known to many fans on Twitter, allows the speaker to have their say and prevent other panel members from interrupting or breaking the ‘house rules’. 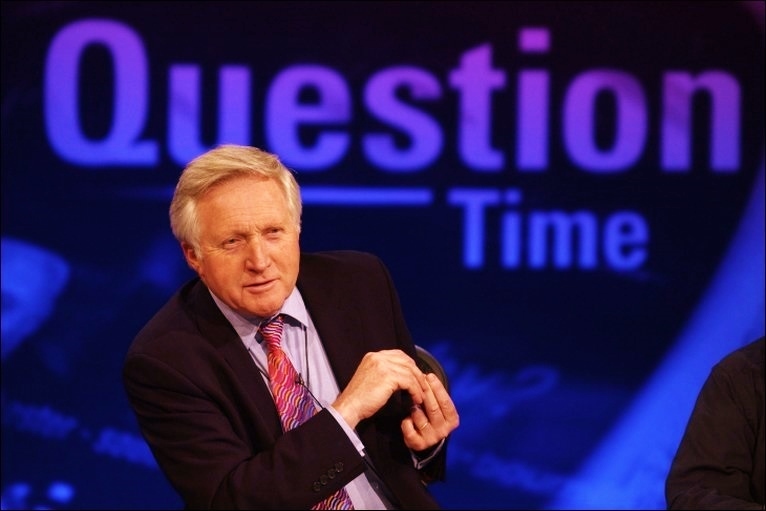 It is Dimbleby’s comradeship which has made Question Time one of the most watched and recognisable political programmes on television. Bouncing off his extraordinary relationship with British politics, he hosted the BBC’s first ever live Election TV Debate in 2010 where the three main party leaders stood shoulder to shoulder in persuading the public why they should vote for them. It was an exciting month on the election campaign, and as chief anchor, Dimbleby once again proved why he is one of the most recognisable and respectable faces in British Broadcasting. David Dimbleby has been at the centre of historic events for over fifty years. His intellect, knowledge and passion for journalism and broadcasting is what comes across most in his respectable and professional presentation. In recent years, there has been a shunt of Dimbleby, in particular The Diamond Jubilee celebrations in 2012. David, however, will remain at the heart of future political events, general elections and hopefully the national events that follow in the future. Do you have a minute for Mrs Thatcher ?